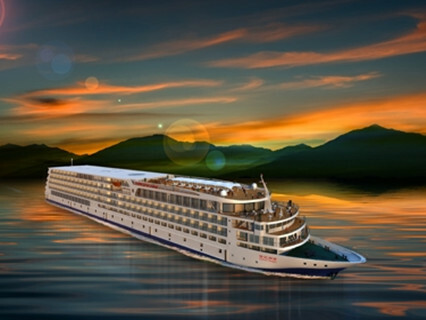 Century Paragon and Century Legend are the newest and luxurious Yangtze river ships made their first voyage in March 2013. Get on board during 18:30 and 21:30 at Chongqing Chaotianmen Port. Safety briefing at 21:00. The cruise sets sail at 21:30. Free coffee, tea and pastries are available in the morning. Do Tai Chi exercise from 6:30 to 7:00. Have buffet breakfast (7:00 - 8:00). Later, free on your own or take an optional tour to Fengdu Ghost City (CNY290 per person). At noon, have buffet lunch. At 14:00, the ship will stop at Zhongxian Port. Shore excursion to Shibaozhai, which was built against Yuyin Mountain during Wanli Period. The whole tower is 56 meters high with 12 floors. There will be a Captain's welcome party from 18:00 to 19:00. Have buffet dinner (19:00 - 20:30). Watch crew cabaret at 21:00. Free coffee, tea and pastries are available in the morning. Do Tai Chi exercise from 6:30 to 7:00. Have buffet breakfast from 7:00 to 8:00. 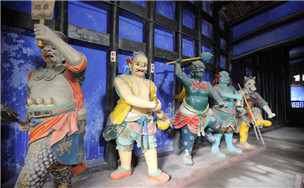 Optional tour to White Emperor City ((CNY290 per person, 7:30-9:30). 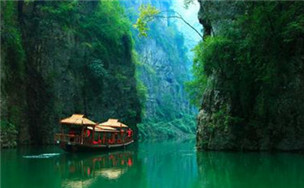 Enjoy amazing scenery of Qutang Gorge on the deck at about 10 o'clock. Have buffet lunch (12:00-13:00). The ship will go through Wu Gorge at about 11:45. In the afternoon, take a boat to visit Goddess Stream. Disembarkation briefing at 18:15. Have buffet dinner from 19:00 to 20:30. Settle the bills later. Play mask ball or sing karaoke if you like in the evening(21:00-22:30). The ship will go through double-line five-grade ship lock at 22:00. It is the biggest ship lock in the world. The ship will climb a height of a 40-story building. Quite an extraordinary experience. Have breakfast in the morning(7:00-8:00). Shore excursion to the Three Gorges Dam Scenic Site, which is the biggest water-control project. 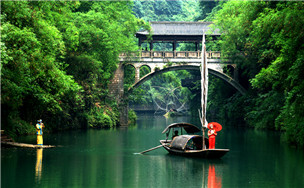 Enjoy the beautiful scenery of Xiling Gorge at around 11:00. Check out at 11:30. Disembarkation at Yichang at 12:00. That's the end of the tour. The itineraries listed above probably be adjusted owing to the bad weather, water level, temporary navigation control and prohibition. 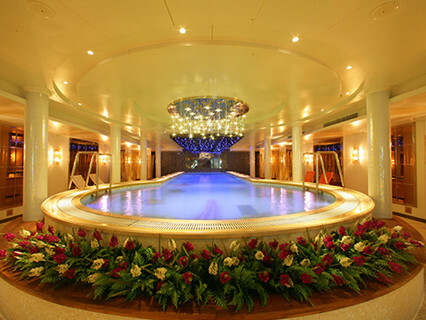 Aboard the cruise: You should arrive at Chongqing before 21:00 to aboard the cruise on the first day. If you need airport transfer from/to the dock, please choose optional service below in the price list. Get aboard from Taohuawu Port at Yichang from 18:30 to 21:30. Embarkation briefing at 21:00. Free coffee, tea and pastries are available in the morning. Do Tai Chi exercise from 6:30 to 7:00. Have buffet breakfast from 7:00 to 8:00. Enjoy the beautiful scenery of Xiling Gorge which starts from Xiangxi River of Zigui County in the west and stretches to Nanjinguan in the east. 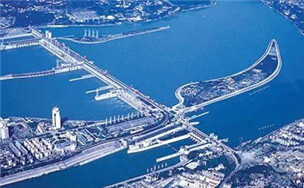 It is 76 kilometers and the longest gorge of the Three Gorges Dam. 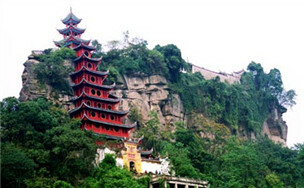 Optional tour to Three Gorges Tribe from 9:00 to 11:30 (CNY290 per person). Have buffet lunch at noon(12:00-13:00). In the afternoon(13:30-16:00), shore excursion to the Three Gorges Dam Scenic Site. The dam is the biggest water-control project in the world. There will be cultural activities from 16:00 to 17:00. At around 17:15, the ship will go through the double-line five-grade ship lock. It is the biggest ship lock in the world. The ship will climb a height of a 40-story building. Join the Captain's welcome party from 18:15 to 19:00. Have buffet dinner from 19:00 to 20:30. Watch crew cabaret at 21:00. Enjoy the amazing scenery of Wu Gorge on the deck at 7:30. Shore excursion to Goddess Stream(8:30-11:00). Have buffet lunch from 12:00 to 13:00. Enjoy the beautiful scenery of Qutang Gorge at 15:00. 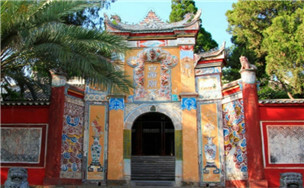 Free at leisure during 15:30 to 18:00 or take an optional tour to White Emperor City (CNY290 per person) . Have buffet dinner(19:00-20:30). Night entertainment begins at 21:00. Shore excursion to Shibaozhai from 9:00 to 12:00. 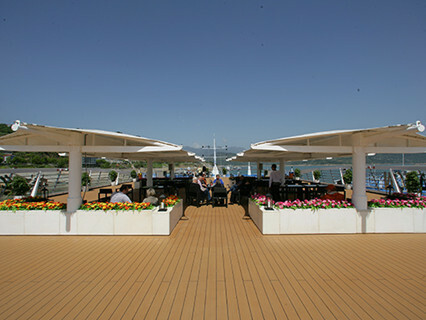 Attend activities on the cruise from 15:00 to 17:00. There will be a disembarkation briefing at around 18:00. Have buffet dinner from 19:00 to 20:30. Later, you will settle the bills. 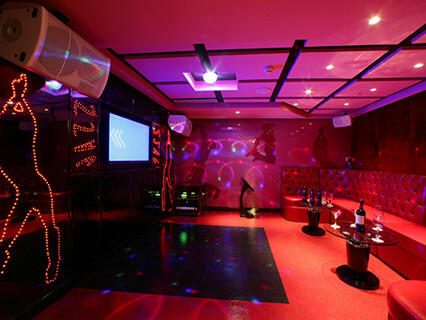 And you can also enjoy your time to watch movies or sing Karaoke. Have buffet breakfast in the morning. Then check out at 7:30 and arrive at Chongqing around 8:00. 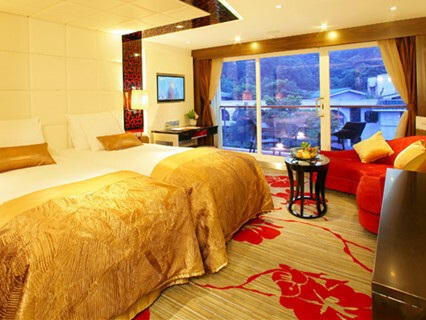 Room upgrading fee(150 per person for each floor). Note: There are only two beds in a cabin. Most of the ships do not provide extra bed, so you may need to reserve another cabin, or a half cabin (0.5 cabin) for the third person (for an adult or a big child) . You can book online or by email, tell us your flight number/ arrival time to Chongqing or Yichang, or the hotel you stay in either city. We will pick you up from the airport(or hotel) to the cruiser. 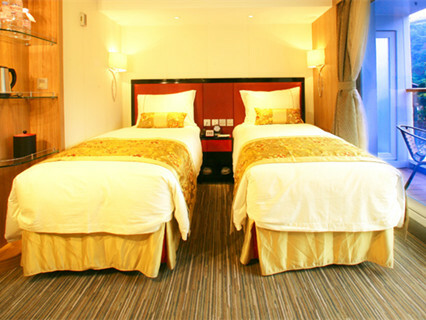 You will receive our confirmation email and voucher after your booking. For urgent booking, please call us directly. Good joking process, but not happy with the compulsory tips imposed on foreigners. more..
We had a wonderful cruise on the River Yangtze. more.. The ship and the cabin were very good, new and clean, the service was good and the personnell friendly with a good service attitude. We liked the cruise program. The quality of the food was partly a disappointment, especially the buffet dinners. Salads and vegetables were ok, the warm main courses should be o more.. Reply : Thank you for sending email to Chinatour.Net. 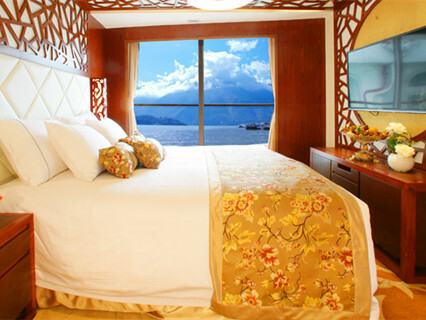 There is no connected room on the cruiser, but we can arrange adjoining rooms for you, is it OK for you? Can you tell us nationality of 6 passengers? Looking forward to your soon reply. Enquiry : Inquiry about ,century parogon lengend cruiser. 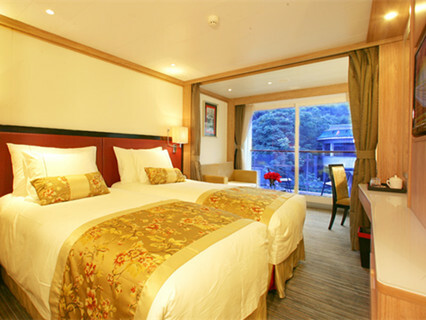 deluxe cabin, Start from ,chongqing. afternoon,can the price go lower based on conditions & criteria.what is the final price in US dollars or CNY? Reply : Thanks so much for your tour inquiry with us, and we can arrange Century Paragon cruiser with deluxe cabin for you, and please tell me your nationality, and then I can check the price for you. Await your reply sooner.